Onda V18 Pro is one of the first tablet powered by Allwinner A63 processor allowing for low-cost tablets with high resolution 2K displays (2560×1600). I received a sample from GearBest, and I already checked out the hardware and run Antutu 7 benchmark in the first part of the review entitled “Onda V18 Pro (Allwinner A63) 2K Tablet Review – Part 1: Unboxing, First Boot, and Antutu 7 Benchmark“. I’ve now spent more time with the tablet browsing the web, watching YouTube videos, reading books, playing games, and running some more benchmarks, so I’ll report my findings in this second part of the review. I’ve found the tablet’s high resolution 10.1″ display to be very good for reading books or browsing the web, albeit the latter feels a bit slower than on Xiaomi Mi A1 smartphone (my main phone). As we’ll see later on, 3D graphics is not that good, so some games that work fin on my phone, struggle to get a decent framerate on the tablet. 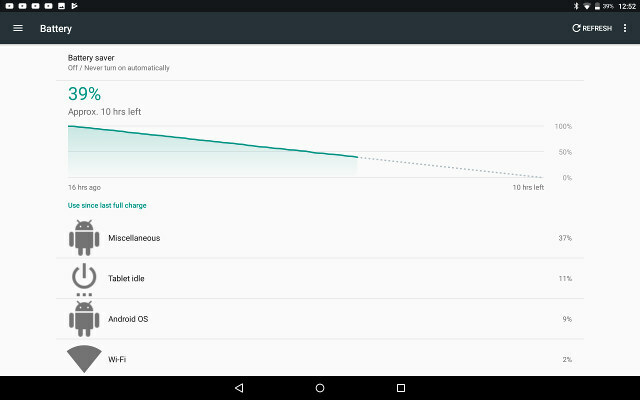 At first, I also had serious concerns about battery life with the tablet lasting only around 24 hours in standby mode after a full charge. The battery information only showed “Miscellaneous” was drawing out a lot of power, but no details about the app. At some point, I replaced Antutu 7.0.4 to switch to Antutu 6.2.7, and battery seemed to work decently after that, so maybe that app was causing the issue. In my case, I found Onda V18 Pro mostly interesting to read ebooks, as the screen is just the right size, high resolution helps making it feel more like a book, and a special reading mode reduces glare. Performance and reliability does limit some of the other applications you may want to use, or at least degrades the user experience. 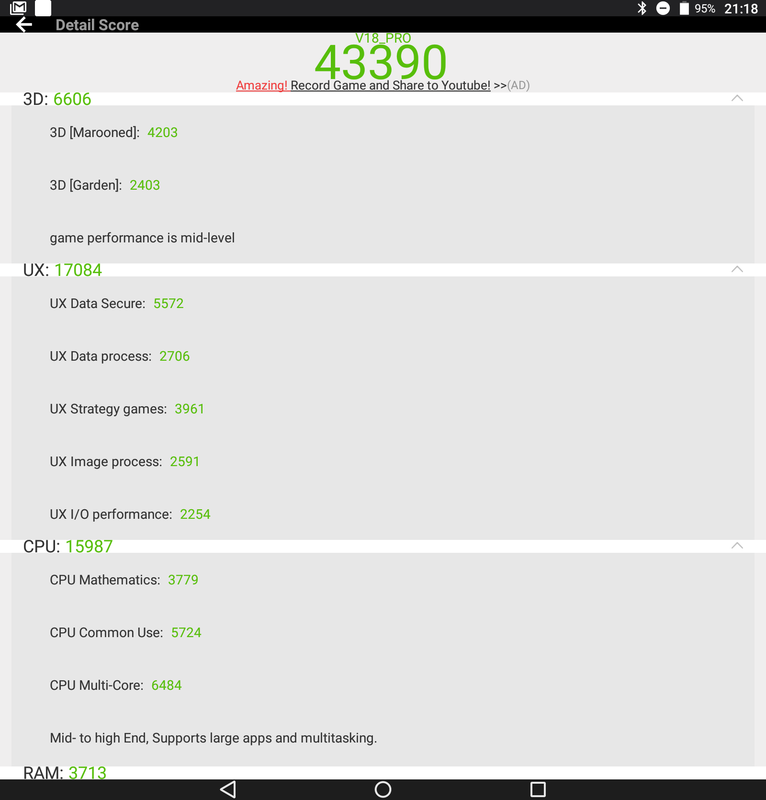 I’ve already run CPU-Z and Antutu 7.0.4 last time, and Onda V18 Pro got a score of 55,254 points. However, since scores obtained from different major versions of Antutu are not usually comparable, I installed Antutu 6.2.7 from Apkpure instead, and the tablet achieved 43,390 points that is slightly higher to other quad Cortex A53 processors with an OpenGL ES 3.1 capable GPU. Considering the resolution is higher than the usual 1920×1080 on other devices I’ve tested that’s rather a positive result. 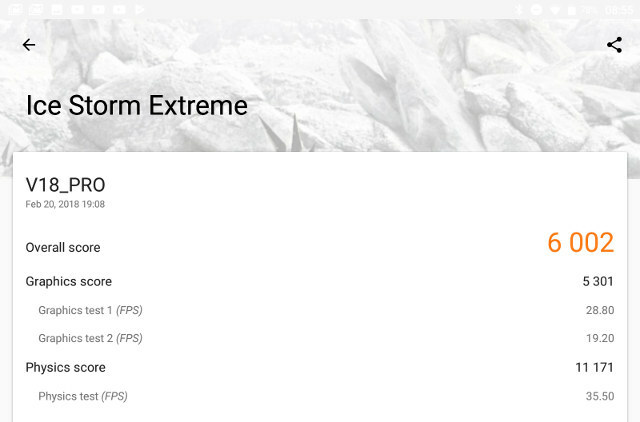 V18 Pro got 6,002 points in 3DMark Ice Storm Extreme, and again the score is a bit higher than for processors like Amlogic S912, but can’t match the nearly 10,000 points from a more powerful and expensive Rockchip RK3399 SoC. I used to run Vellamo to test browser performance, but the app is not maintained anymore, and Qualcomm removed it from Google Play. So instead, I’ve run a benchmark app that I normally run on Windows 10 PC: PCmark. 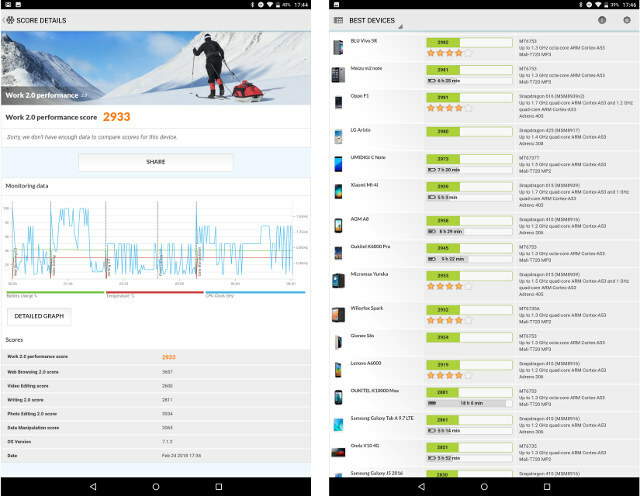 Onda V18 Pro tablet reached 2,933 points in Work 2.0 performance benchmark. It’s the first time I run that benchmark so I don’t have references, but if we browse other devices this corresponding to platforms with Snapdragon 400/600 series, or Mediatek MT6753 octa-core Cortex-A53 processor at 2.2GHz with PowerVR G6200 GPU. 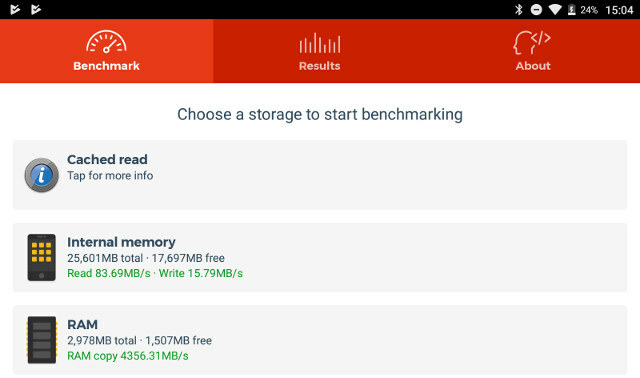 A1 SD Benchmark was used to measure internal storage (eMMC flash) performance., but sadly the value for read speed is invalid (Cached Read), and we can only check the write speed which at 15.79 MB/s is underwhelming, and may explain some of the sluggishness I’ve experienced with the device. So the poor download speed is confirmed here. I repeated the download iperf test three times just to make sure. Note that I could not connect to my usual access point, as connection will often not go through, so I connected to another access point that’s even closer to the tablet. The rear camera only give mediocre results, especially in low light conditions, but the lack of flash obviously does not help. Many of the photos have pinkish whites when I looked at them on my computer. You can click on the carousel below to check samples in original size. You’ll find some more sample for the front-facing camera below, and the results are sort of acceptable as long as the object do not move at all. Easy with statues, most challenging with dogs  Resolution of photos: 1600×1200. I also used the camera with a Skype video call, and it worked OK on the video side as long as I went in a location with good lighting. However, I first started the call with headphones, and the other side could not hear me. I removed the headphones, and we could talk using the built-in speaker and microphone. I tried some videos in Kodi and VLC, and I could play Big Buck Bunny full HD video from a SAMBA share in both apps, but for 4K videos, I had some troubles over WiFi (buffering), so instead I copied the video to the flash, and played them from there. Let’s say it might not be the best tablet for play 4K videos on the go. Youtube worked OK (as long as the connection to WiFi was good enough) with the maximum resolution being 1440p. Except for the first day, I usually had good results streaming YouTube videos despite the poor WiFi performance mentioned above. 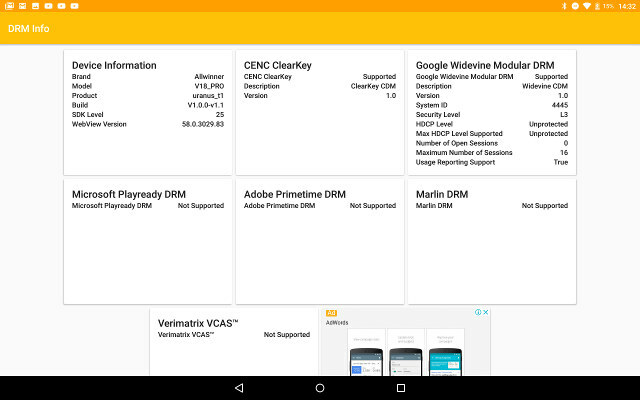 The tablet supports Widewine Level 3 DRM only. In order to get a more standardized evaluation of the battery life, I’ve been recommended to use LAB501 Battery Life app which provides ways to test battery life for web browsing, video playback (720p), and gaming use cases. I planned to fully charge the tablet, and stop the test when the battery level reached 15%, however for some reasons the browser test stopped at around 50% twice. A full charge sometimes stops at 98%, and won’t go to 100% even after one hour or more. 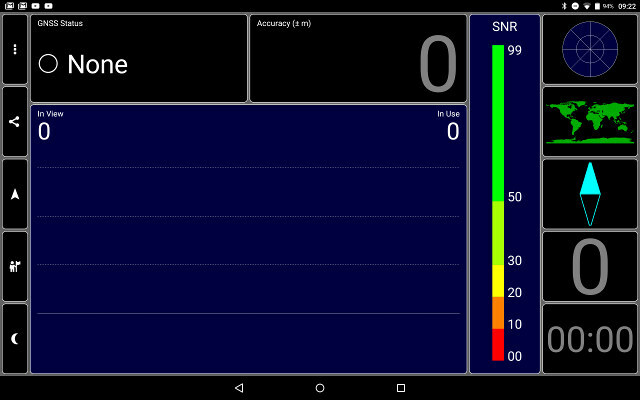 Wi-Fi was on, and brightness set to 50% for all tests. 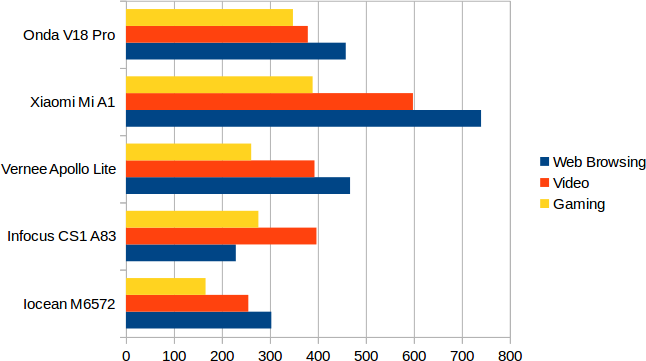 I’ve normalized all results to 100% to 15% use case, and compared battery life of the tablet to other mobile devices I’ve tested in the past. Onda V18 Pro is right in the middle, better than older devices, but the battery won’t quite last as long as on Xiaomi Mi A1. While it’s true the larger display should consume more they should also have more space for the battery. Charging from 15% to 99/100% takes around 3h30, so no fast charging here. I managed to connect two different Bluetooth headphones and watch some YouTube videos with either, as well as transfer some photos from the tablet with Xiaomi Mi A1 smartphone. However, Smart Movement app for my BLE fitness tracker could not be installed, and none of the other BLE app (Mi Fit, Vidonn…) could be installed from Google Play either (not compatible with device), so it’s quite possible Bluetooth Smart / Low Energy is not supported. Riptide GP2 – I install the game from Amazon Appstore app as usual, but when I started the game I would always getting an pop-up window with “Amazon Appstore Required”. I could not find a fix, so I did not test that game. CSR2 – Gameplay around 10 to 15 fps hardly playable. The game auto-detects graphics performance, but does not also do a good job at it, and in this case it probably set the graphics quality too high. So I had a mixed experience with games. That’s my favorite use case for this tablet reading books either PDF files through Foxit Reader, or some e-books downloaded from Amazon Kindle app. Reading is comfortable thanks to the high resolution screen, and reading mode to reduce glare. At least, that’s my opinion indoors, as outdoors the screen may be hard to read depending on lighting conditions. YAMTT app shows the touchscreen supports up to five touch points. The mono speaker in the tablet is not really that good both in term of clarify and volume, so I’d recommend using a headphone when possible, except if you need to use the headphone’s microphone as in my case it did work, at least not in Skype. Overall, the tablet has too many shortcomings, and it’s difficult to recommend it, except potentially as an indoor e-book reader, or for watching some full HD videos on the go. WiFi download speed rather slow (1MB ~ 8 Mbps), and limited to 802.11n @ 2.4 GHz. Difficult to reliably establish connection with one of my access points. 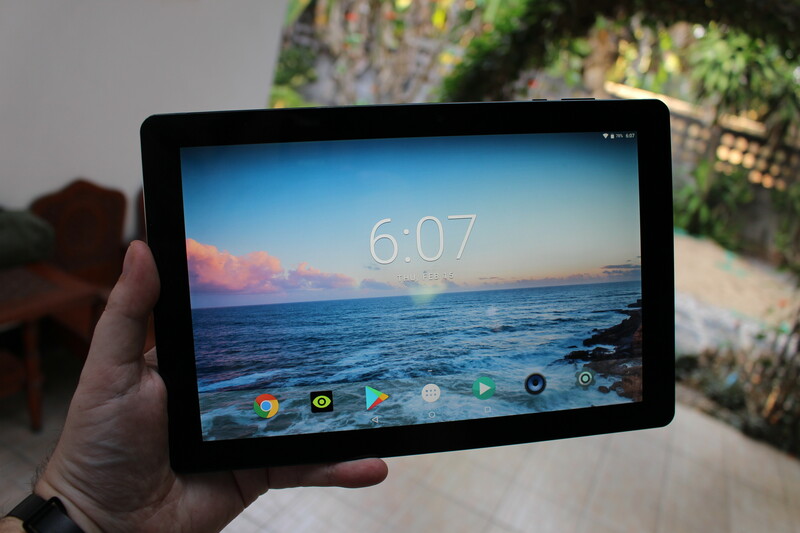 If you’re still interested in the tablet, GearBest offers it $168 shipped, but you’ll also find it on Aliexpress with or without keyboard, GeekBuying, and other sites for $160 and up.